Beauty and the Beast is officially in theaters and it’s safe to say it’s a pretty big deal. In its first week in theaters, the film was easily a box office smash, earning $462 million worldwide. 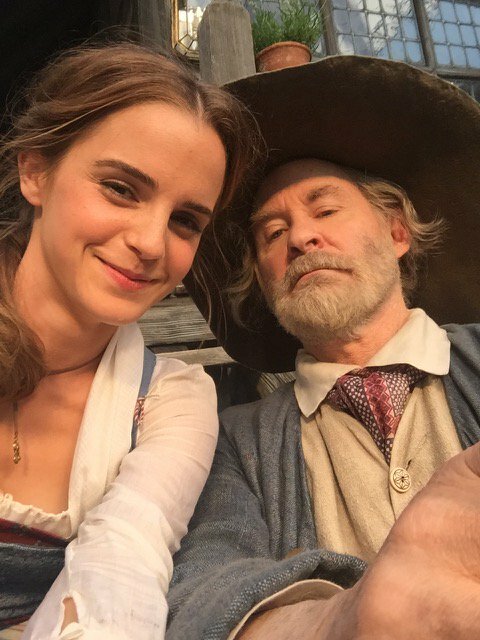 To thank fans for their unconditional support for the new Disney film, star Emma Watson took to Twitter to share some behind the scenes photos of herself, the set, and her movie dad, Kevin Kline. In the photos, Watson is rocking the iconic blue dress and white apron and is in a massive kitchen set. We can’t get over how hilarious she looks in a 1740s French kitchen while simultaneously rocking an iPhone. We also love the pic with Kline. It seems as though Belle and Maurice were just as close off-screen as they were on-screen. But it’s not surprising that it seems like Watson had an amazing time on set because it seems like the entire cast had the time of their lives while filming. Anyone who follows the stars of Beauty and the Beast on Instagram has seen ~thousands~ of behind the scenes photos of the cast and they all seem like legit BFFs. We’re only feeling a *little* bit of FOMO. We love all the behind the scenes photos from the set and press tour of Beauty and the Beast. The film is such a Disney classic that we couldn’t imagine anyone working on it and not having the best time ever.